As I recall Michelin announced sometime this year that in October they would be introducing All Season Run Flats for Z51 equipped C7's. My local dealer will take my preorder if I can provide proper description and/or part number. I called Michelin (got knocked around like a ping pong ball between five people) and after an hour on the phone no one at Michelin I spoke with knows a thing about these tires. Frustrating as a consumer to know more than the people working for the company. I just emailed the CEO of Michelin North America directly as I have my simple way to get any executive's email at a company. If I hear from him I will let you know. In the mean time does anyone recall specifically what these tires will be called? I seem to remember Michelin Super Sport +3 All Season ZP...but my memory not as good as it once was. Any information you can provide would be much appreciated. I have heard rumors of you folks to produce an A/S run flat tire for the Corvette 19/20" tire size for the Corvette. We first heard late 2015, then summer 2016. Are there ANY plans to produce the A/S tire in a Zero pressure option sized P245/35ZR19 and P285/30ZR20 and if yes, when? We do have a plan to offer an All Season tire in both of these sizes as well as being a run flat called the Michelin Pilot Sport A/S 3+. Our projected release dates for both sizes are October of this year (2016). We don't have a specific date it will be released but keep in mind that this date is a projected one. The actual date would be subject to change in either direction. To see details on this remarkable All Season Run Flat tire click http://www.michelinman.com/US/en/tir...-s-3-plus.html. We hope that your issue has been resolved or addressed to your satisfaction. If we can assist you further, please respond to this email or call us at 866-866-6605 (toll-free) between 8:00 a.m. and 8:00 p.m. EST Monday through Friday or between 8:30 a.m. and 4:30 p.m. EST on Saturday. Second reply to my followup email. As stated in the previous email, we do plan to launch the A/S 3+ tire in both of the listed sizes and both in ZP or Run Flat in October 2016. 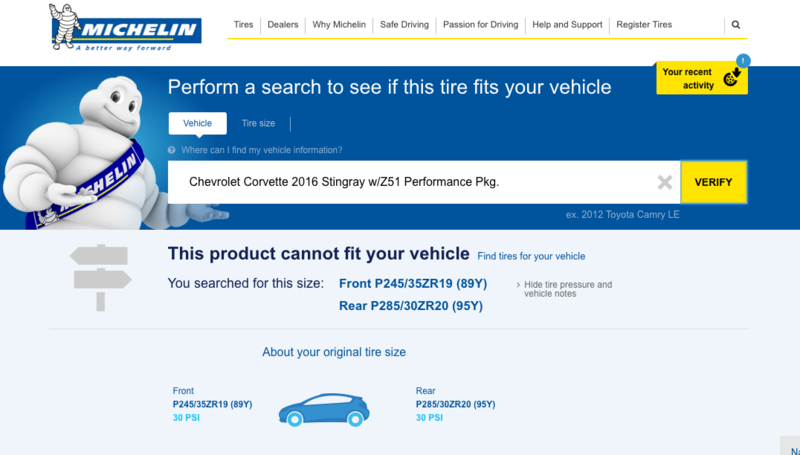 The link was sent as a generic one so you could see details about the tire mentioned because the new ZP sizes will not be listed on the site as available until their release later this year. In short, we are planning to launch the Pilot A/S 3+ in both 245/35ZR19 ZP and 285/30ZR20 ZP in October 2016. Last edited by eboggs_jkvl; 08-29-2016 at 11:15 AM. Many thanks Elmer! Just learned from local distributor that there is a sku number issued for fronts but not rears yet. He said to call back in two weeks. Last edited by PUGPROUD; 08-29-2016 at 12:01 PM. Last edited by PUGPROUD; 08-29-2016 at 07:38 PM. Can we have a nice long tadaaaaaaaa!? A/S 3+ - They are not run-flat tires, just an update on the A/S 3. They are not run - flats. Read the tire spec carefully - They are ZP tire sizes - not ZP tires. They are updates from the original A/S 3 tires. Huh? That is not correct. On tires, ZP always mean "zero pressure." It stands for a tires rated to be able to run for a short distance up to 50 mph with zero pressure because of the reinforced sidewalls. The tire size is all the numbers that appear before ZP. Are these tires for only 19" and 20" wheels? Last edited by alamo1974; 08-30-2016 at 09:34 AM. The man was adamant about the information. He referred to ZP on A/S 19/20 sized tires to fit the Corvette. He explained the link that he gave as simply a source of information on the qualities and capabilities of the ZP tires that are coming out for the 19/20" size. I believe they are already offered for the base 18" and 19" wheels. I don't, but a lot of people have been wanting them for the larger wheel sizes on Z51, GS, and Z06s. Last edited by Foosh; 08-30-2016 at 10:27 AM. I believe they are already offered for the base 18" and 19" wheels. I don't, but a lot of people have been wanting them for the larger wheel sizes on ZF, GS, and Z06s. I had those on my 2007. The increase to 19/20" was our issue. The ZP at the end is not an indication of any sizing. It means Zero Pressure AKA Run Flat. When I got the information from Michelin Customer Care I emailed back asking for confirmation that the nomenclature they gave me were indeed A/S run flats. They wrote back and said they were. I gave all the emails to my local dealer to order when available saying if these are not right his issue is with Michelin not me. He said the 19" are currently available but not the 20" yet as someone mentioned above. Yes Elmer, see post #8. Last edited by chronage; 10-14-2016 at 12:37 PM. Oh wait? Is this October? Not in stock but they can be ordered. They are ZP or Run Flat and are A/S3+! I guess Michelin made the October Date! Last edited by eboggs_jkvl; 10-14-2016 at 04:36 PM. I called the Discount Tire business and he looked in his system. He found the tires and offered them to me. Last edited by eboggs_jkvl; 10-14-2016 at 06:49 PM.